Identify the significance of using independent research as a basis for making design decisions in schools. Assess the health and safety performance aspects of a variety of design characteristics and materials as they relate to durability and sustainability. Explain the importance of working with a collaborative team to make design decisions that have positive impacts on student performance, indoor air quality, and health. Determine ways to incorporate the design principles presented into buildings that are sustainable and high performing, as shown in case studies. Winston Churchill is famously quoted as saying, “We shape our buildings, and in turn they shape us.” While that resonates with architects and others in a broad and even philosophical sense, we often need more specific information to justify making design decisions intended to shape people in positive ways. This is particularly true in the world of education and school design, which is paradoxically challenged to promote high student outcomes within very real budget restraints. The question often comes down to priorities and determining where the available funds are able to do the most good. 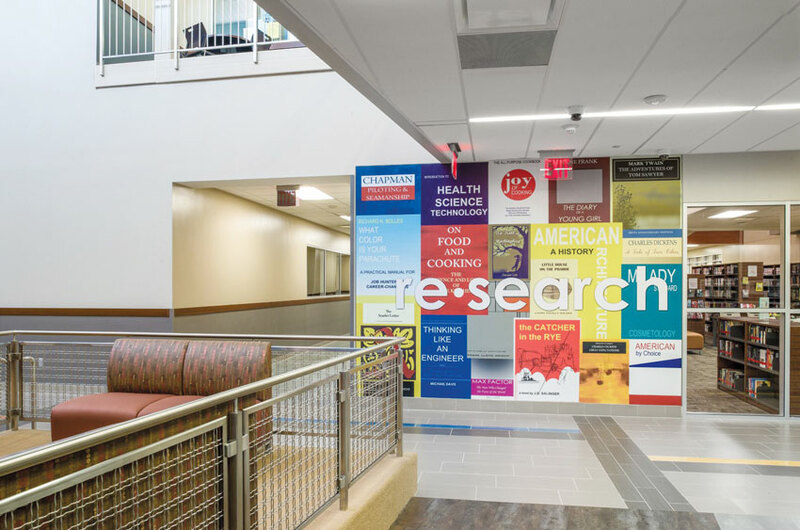 Positive, identifiable connections have been found between student performance and some common building design parameters, such as color, complexity, light, connection, flexibility, and choice, according to a recent research study carried out in the United Kingdom. The high school in this photo shows an appropriate use of colorful graphics to stimulate learning. Toward that end, a recent study of original research published in the journal Building and Environment conducted by a team in the United Kingdom headed by Peter Barrett has shed some light on this subject.1 Titled “A holistic, multi-level analysis identifying the impact of classroom design on pupils’ learning,” Barrett and his colleagues explored ways to measure impacts of school building design on the learning rates of pupils in primary schools. They developed hypotheses under three design principles: appropriate levels of stimulation for students, naturalness of the environment, and individualization. Under these broad categories, they investigated 10 design parameters within a neuroscience framework. These were tested using data collected on 751 pupils from 34 varied classrooms in seven different schools in the United Kingdom. Based on their data collection and analysis work over the course of a school year, Barrett and his team found strong connections between classroom experiences and six particular building design parameters: color, complexity, light, connection, flexibility, and choice. They also determined that it was possible to estimate how much of an impact these particular design elements played on improved learning. In the case of this study, they found, on average, a 25 percent contribution to better learning due to the classroom design after accounting for other factors. This is strong evidence of the significant impact that design aspects of the built environment can have on pupils’ learning progression. Not only are research findings like this important for policy makers, designers, and users to be aware of, they have great value in making and justifying design decisions. To illustrate how research like this can be used in day-to-day design situations, we will look at some of the theoretical and practical ways to incorporate the three broad categories (stimulation, naturalness, and individualization) and the six referenced design parameters (color, complexity, light, connection, flexibility, and choice) plus others into new and renovated school designs of the 21st century. Under the general design principle of appropriate levels of stimulation for students, color was addressed based on the degree to which the “color mood” was appropriate for learning and teaching. While the researchers looked at the color of classrooms, it is the color of all areas of the building that certainly contribute to the overall color mood. In general, they found a tendency for warm colors that may complement the young pupils’ extroverted nature, while cool colors seemed to enhance concentration and learning. As a design guideline, they suggest that warm colors are welcomed in senior grade classrooms and cool in junior grades, as long as it is bright. While many things in the building provide color, they found the constructed walls and floors to be the most important. The pragmatic design challenge with this finding in schools is how to provide appropriate color in a way that is durable and rugged enough for high use areas and still work within budgetary limits. One of the common material selections to provide wall surfaces and even exterior walkway surfaces is brick masonry. Part of its appeal is that a full range of choices are available that are aesthetically diverse and technologically strong, including custom colors, blends, textures, and shapes. Brick manufacturers often collaborate with architects and interior designers on design concepts to provide unique solutions that efficiently bring vision to reality. Brick is a highly versatile solution that is available in a wide spectrum of colors, with a multitude of shapes and textures. In some cases, an alternative in the form of thin brick veneer is desirable in a school design. Thin brick veneer expands design potential by reducing the space requirements of brick, creating real space savings throughout a building, while still maintaining a robust choice of colors. This approach can be used in tilt-wall/tilt-up, precast, and adhered veneer installations. Structurally, the reduced depth and lighter weight provides less impact on the supporting structure, with fewer seismic concerns than full brick. Further, less material often means less cost overall as well, with reduced wall costs through the elimination of shelf angles, lintels, and other miscellaneous items. Thin brick installation often reduces man hours 15–20 percent relative to conventional brick installations. And, depending on the substrate, thin brick veneer may be a more sustainable choice since it consumes fewer raw materials and requires less energy for manufacturing and transport. According to members of the Schenkel/Shultz Architecture firm, “The long-standing reputation for quality products and the ability to manufacture matching thin and full-size brick units that met the design criteria for this project solidified our selection.” This combination of student-enhancing color availability and technical capability give brick and thin brick veneer attributes worth considering in school designs. Wall and floor materials of a school building can contribute to the overall color mood, which has been shown to have an effect on student learning. Education facilities demand quiet environments for both students and teachers. AMBICO manufactures industry-leading acoustic swing and slide door assemblies. Doors are available in steel or wood veneer. For all classroom, industrial shop, gymnasium, music room, auditorium, studio, or stage applications, make AMBICO part of your sound-barrier solution. Introducing the new Plastic Laminate Partitions with Moisture Guard™ Edge Banding. Our Moisture Guard™ Edge Banding fuses with the substrate, creating a seamless beveled profile that eliminates any unsightly black lines that appear in standard plastic laminate. Floormations® is the new way to stop tracked-in dirt, debris, and water from entering your building. This aluminum-milled entrance flooring system is an innovative, durable solution available in a wide array of patterns and surface options, plus the ability to incorporate your own unique design or logo. CS Sun Controls are custom designed to attach to any type of building, and precision attachments are manufactured for all curtain wall or masonry projects. CS offers a range of applications designed to meet your project’s specific shading requirements. Design options include vertical and horizontal orientation, cantilevered, or suspended support. With an innovative electromechanical drive and microprocessor motion control system, the ED900 is an advanced low-energy swing door power operator that is exceptionally quiet, safe, and easy to use. When operated manually, the ED900 demands little physical effort. Advanced power assist through the entire opening cycle makes even the heaviest-rated door feel light. Thin brick is a full brick alternative that can expand your design potential. Thin brick’s space saving and affordability put real brick within reach for countless interior and exterior applications. Matching thin and full brick is available, and thin brick can also be used with our patented masonry support system Thin Tech®. Guardian CrystalBlue™ glass can be combined with many SunGuard® low-e products, giving architects a range of energy performances along with high visible light transmission in an in-demand soft blue color. CrystalBlue glass is available coated and uncoated at a 6-millimeter thickness in a variety of sizes. NanaWall FlexSpace evolves traditional classrooms into learning environments that are agile and adaptable. Optimizing the limited floor space within the building envelope translates into reduced construction costs. The multiuse spaces also contribute to reduced operating costs as teachers can share resources and cross collaborate, creating a more efficiently run classroom. PremiSys® Fusion hybrid DOAS systems deliver 100 percent outdoor air with more than 20 perfect greater efficiency than traditional DOAS systems. These systems maintain the quality and value of standardized products while earning valuable LEED points. Learn more at MitsubishiPro.com/Ready.